Field Supervisor of Trench PF 10, Katherine (Katy) Blanchard. The return from the four-day break, whether spent near a beach or in a museum, always revives the energy in the trench. Four days to clear our heads from the muggy weather of the Mugello and also of the confusion of the trench. 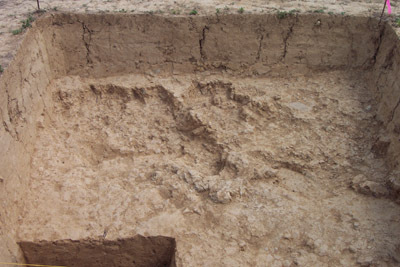 View of Trench PF 10 at the end of Week 4. This week has seen a pass throughout the entire trench. What this means is that we are better able to see the rock and tile as it lies on the exterior of the structure. PF 6 has been reopened and the balk we had left between that trench and ours was taken down today (this balk had been left so that our scarps would read the stratigraphy of the field, not the refilled trench). 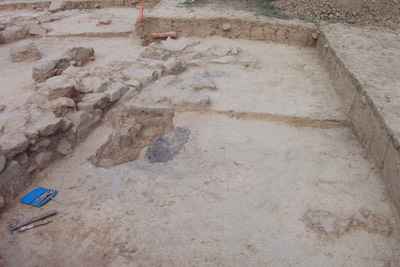 The wall that enters Locus 1 on the western side has been more clearly defined. Michael Joyce and Rebecca Cooper working in Trench PF 10. Have our questions been answered? In some cases, yes. The burned feature is burned into Stratum 3, not lying upon it. The only artifacts, broken and full, come from within 1.5 meters of the wall. The rest of the trench is upon sterile soil. And Michael, Andy, Hillery, and Rebecca have been indefatigable in their efforts to finish our passes, especially when it's slow going through the hardened and sometimes sterile soil. It is important to discover that this is an uninhabited area--to put the perimeter on the land the Etruscans were using. Left: Andy Bozanic removing the balk between PF 10 and 6. Right: Rebecca Cooper digging in PF 10. Hillery Pous making a new pass in Trench PF 10. To further explore this, two sets of non-intrusive survey have occurred. Last week, Dr. Frank Vento led a Ground Penetrating Radar survey south of our excavated areas. This week, Dr. Dario Monna ran resistivity tests in the same area. We are looking forward to the results of these surveys--as they do not harm the site in the way that a shovel-test-pit grid would. But perhaps the most important thing we learned this week is: Don't eat the berries. 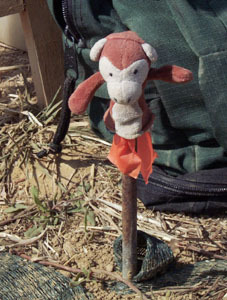 Left: Jungle Boogie Monkey. Right: Assistant Field Supervisor Michael Joyce. Hillery Pous, Katy Blanchard, Andy Bozanic, Michael Joyce, and Rebecca Cooper. 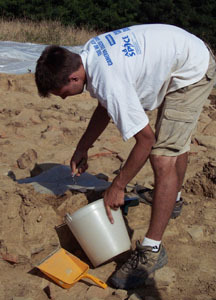 Rain is a part of the archaeological experience. The overcast skies made the flowers near where the students are picked up brighter, and also kept the soil from baking in the noonday heat. 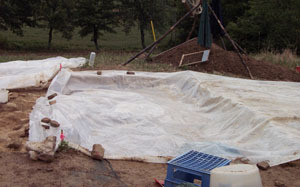 However, it also seeps in under the plastic tarp and silts up the corners. This week has simply proven to me that Andy, Hillery, Rebecca and Michael are true excavators--barefoot and dripping they continued the passes. We have tried to finish the definition of the feature, but the dampness of the soil has made determining the edges difficult. Today the sun came out and the edges of the trench are starting to dry. Trench PF 10 covered to protect it from the heavy rains of Week 5. The beginning of this pass involved pulling the rock and tile at that level and taking a 5 cm pass underneath all of this. However, as this pass was completed, they came across more rock on top of more tile. This means that we still have one more pass to take to understand the spill from the wall. View of Trench PF 10 from the south. The students have asked many good questions this week: if this is wall spill, why are there tiles underneath and on top of it? As we define the feature, it appears to be in line with the corner stone in the building, so does this mean it could have been a corner post that has fallen? Since there do not seem to be any significant tile pieces, how can the carbonized wooden feature be a roof-bearing piece? All good questions. And right now all we can say is that perhaps the rubble at this level is only indicative of an earlier wall phase. The carbonized wooden feature has grown considerably smaller as we have more carefully defined the edges of the feature and the edges of the stain. It is not likely a large beam but likely smaller twigs as part of a wall construction. Next week is the last week. And we will only have this one last pass to answer our questions. Detail of Trench PF 10. The end of the season has seen the opening of a new trench to test the results of a magnotometry survey done last week. PF12 is set up as a 5m X 5m trench, on the grid, exactly 10m south of PF 5. This season will only see the excavation of the NW locus, Locus 1. Michael Joyce and Lynn Makowsky clearing for the opening of Trench PF 12. We expected to be finished in PF10 and expanded, if you will, into the center of the field to see if there was in fact a building on this flatter section of the land. The resisitivity survey that Andy and I ran a few weeks ago also came up with a large anomaly in this corner and we are hoping that there is a wall, and not an early upcropping of bedrock below the surface. The trench was opened yesterday afternoon, with rotating members of PF10 trying to use their larger tool skills once again. They had finally finessed the use of a dental pick and then I gave them a shovel. Katy Blanchard with Hillery Pous, Andy Bozanic, and Justin Gosses in PF 12. My assistant, Michael Joyce, has been a great help as this new trench opens. We will have both trenches running at the same time, just far enough away that the students need to yell if they have a question. Thus far, a 30cm pass has been taken in the trench and soon we will sink a sounding locus in the NW corner to find the bottom of plow zone so that we can finish the plow zone in two passes. At this point, plow zone could be from 5 to 20 more cm. 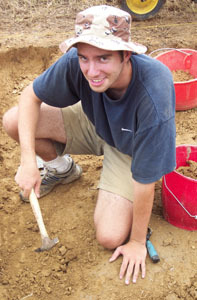 Andy Bozanic excavating in Trench PF 12. Justin Gosses, working in Trench PF 12, is also here to conduct tests on our kilns. The last week, and as of the writing of this report, one day of excavation left. The end of the season is when you think you have arrived at conclusions, and then something new is discovered. Carbonized feature in Trench PF 10. Today, between the feature and the wall, where we thought we had scraped down to Stratum 3, we found more of the feature at a lower depth. Not much lower and so this begs to be answered, were we not really on top of sterile soil? Also included in this new patch of unexcavated soil was a large tile. Tomorrow will see the definition of the edge of the feature, the previously sterile soil, and the wall. 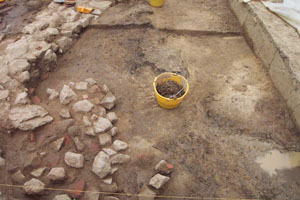 View of Trench PF 10 from the south during Week 6. We had thought that PF10 would be finished by earlier this week; however, every day as Rebecca and Hillery continued to clean and define we realized that another pass should be taken and that the wall could be defined more. They have kept PF10 together now that PF12 is running. Next week will be the final report, and perhaps then we will have some more answers. projecting from the scarp in Trench PF 10. Hillery Pous taking a pass in Trench PF 10 during Week 6. Justin Gosses and Hillery Pous in Trench PF 10. When the whole crew must work in PF 12, a decoy is left in PF 10. As of the writing of this report, Andy and Michael have taken PF12 down to about 1 meter in depth. This is no small feat, considering the heat, the soil, and the height to shovel the soil into the wheelbarrow [I lost this "skill" about 20 cm ago]. And what has been found? Andy Bozanic and Michael Joyce at work in PF 12 under Katy Blanchard's watchful eye. A stratum previously unknown in the FOD. There is, in fact, a stratum of soil that represents time between the Etruscans and today. And so far, this stratum is about 65 centimeters deep. This soil is not sterile, it does have a very few grotty bits. There were roots found throughout the locus, and thus it could be evidence of bioturbation. However, the pieces are not near the roots. Also found were a fineware base, modern tile with finish, a small piece of modern concrete, and a piece of plastic we like to think of as the augur's staff from the Posable Augur-Action-Figure. Yes, folks, they finally found something in PF 12: a coarseware base fragment. Hillery Pous, Katy Blanchard, Michael Joyce, and Andy Bozanic respond. At the close of today, an unusual soil stain had appeared, as well as a large upcropping of clay. The clay here appears to be yellow, green, and the blue/grey we are used to. What we don't have is bedrock or the soil we associate with being above bedrock. 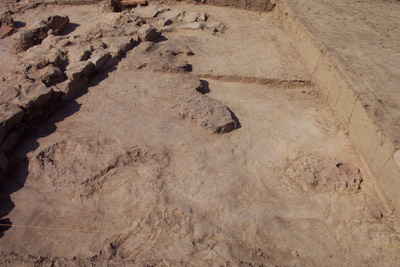 View of Trench PF 12 during Week 6. Tomorrow, I anticipate finishing this pass and seeing if the clay was perhaps the anomaly on the surveys. I would also like to take a 1m x 1m section in the corner and take that down to bedrock to explore the depths of the field in this flat plateau. 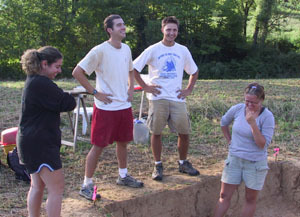 Three classic examples of The Archaeologist's "hmmm" Pose. Field Supervisor Katy Blanchard and Assistant Field Supervisor Michael Joyce. It is archaeological tradition for the last few days of excavation to throw a few surprises into the picture. This year, in PF10, we were indeed surprised. As Hillery and Rebecca finished the last pass through what remained of Stratum 2, they realized that our carbonized wood feature was appearing at a lower elevation than we had noticed it before. At higher elevations it was much lighter, but at this level it was almost pure black. Carbonized wood feature in Trench PF 10. To ascertain an approximate depth of our carbonized wood feature, we had previously defined it and saw that it was about 2cm thick on its eastern edge in Locus 4. As Hillery realized it was pure carbon on the western side below this, we started to rethink our feature. We investigated the area where Locus 1 and Locus 4 met, between the feature's western edge and the wall. Here, we discovered a large flange tile. This was one of our surprises. 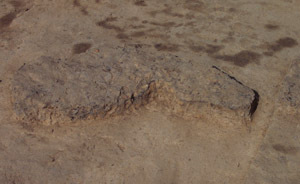 We had assumed that because when we defined this feature from the east and saw it on sterile soil, and that because there had been no pottery inclusions throughout the entire feature, that the feature was wood [something like a pile of wood set outside a wall] burned into the stratum. This tile proved us incorrect. After we extracted it, we realized it was actually on top of Stratum Three--that there was a pit dug into the lower stratum that perhaps this burned feature covered. With only Friday left to excavate, I had Hillery and Rebecca work on clearing this out so that the pit could be dug and we could attempt to rethink the order of how things occurred. View of Trench PF 10 from the south at the end of the 2002 season. 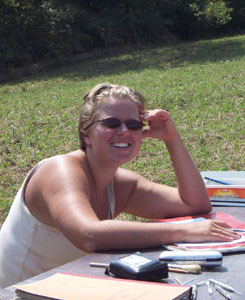 Friday afternoon, Rebecca started to discover bone fragments. Bone inclusions are not unusual for our trench. However, after trying to isolate the fragment, she realized it was several fragments. And several large fragments. We set out to remove as many as possible intact, trying to identify any of them. It started to rain lightly while we were excavating the bone, and our trench mates were very kind in holding the plastic over us while we continued scraping at the fragments, hoping to make progress. Due to the lost days during our week of rain, we also dug on Saturday. Rebecca finished excavating the bone fragments before we went down on Saturday afternoon. These fragments were not very large, but identifiable amongst them were an end of a long bone, a tarsal fragment, and several teeth. These were in a line and hard to identify in the soil at first, but soon we all grew accustomed the difference in color and density. On Sunday I finished excavating the pit, to find its dimensions and while digging, I came across a lot more bone, and another grouping of several teeth. Both times they appeared in a line; however, they did not appear in a jaw, or near anything that I could positively identify at this time as a jaw. Both sets appear to be two or three small teeth, all animal, and no where near the size of a tooth that Hillery removed from the wall packing last week. 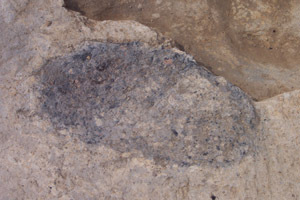 While defining the edges of the feature at this new lower elevation, body sherds of black glaze started to appear more frequently. 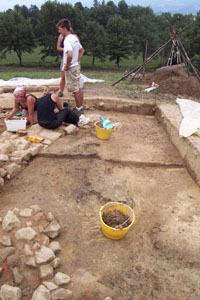 Throughout the week, Hillery was coming upon black glaze body sherds all throughout this area. On Sunday, a full base, with incised line, was found. 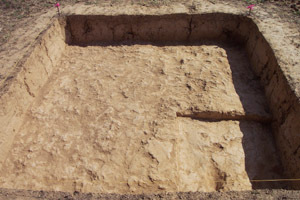 It became clear while defining the feature that the other pit, with the bone, was separate from this pit, of black glaze, by a wall of Stratum 3. That is to say, that Stratum 3 existed and two separate pits were dug into it and used. Due to the lack of time in the season, the second pit was not dug out. I believe that more of this black glaze vessel will be found within this pit. View of Trench PF 10 from the north at the end of the 2002 season. The end of the season brought us full circle: we have found the wall we knew would continue through this locus. We did not find any other walls, thus giving us a dimension to the structure in the FOD. We found a carbonized wood feature, which was assumed to be a stack of wood lying outside a structure used in pottery production [that is, a very useful stack of wood] that had burned into the top of Stratum 3. The last few days showed us that before this burning occurred, at least two pits had been dug outside. I do not opine one pit was purely for bone, and one for black glaze. 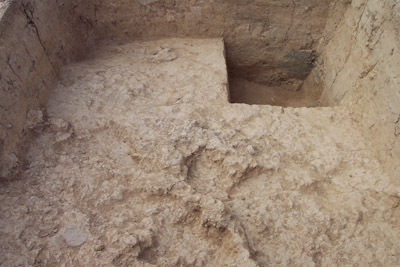 Without excavating the second pit, we do not know what else it holds. It could contain more bone. The most notable thing about the bone fragment pit is its proximity to the wall: it is within 20 cm of the wall. For people to have a refuse pit that close to their habitation is unusual. Further, the bones were in very small fragments, and not a full variety is represented [no skull, vertebrae, ribs, pelvic, etc. fragments were found]. Why a second pit was dug right to its east, so that they almost touch, is also puzzling. What purpose did they serve? Katy Blanchard, Andy Bozanic, Michael Joyce, and Rebecca Cooper. Unfortunately, we did not answer all of our questions. However, we learned that what you answer at the beginning is often unanswered by the end. I thank my trench team, Michael Joyce, Andy Bozanic, Rebecca Cooper, and Hillery Pous for such a wonderful season; they helped all W.T.F. breaks go much more smoothly. Andy Bozanic finishes definition of a foundation wall in Trench PF 10. 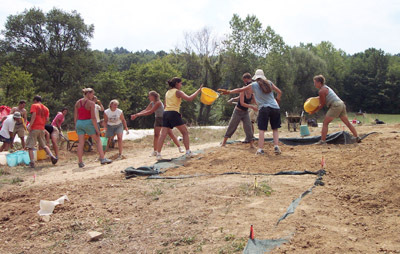 Students and staff from all trenches backfill PF 10 (and other trenches) in the Podere Funghi. 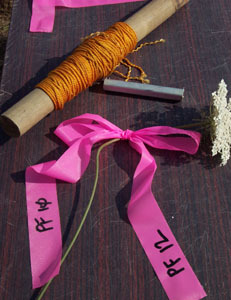 The end of the season is just after the beginning of the season for PF12. Which can be frustrating and rewarding, to have a mini season within the larger one. Andy and Michael continued digging through our Stratum 2 [because PF12 is not connected to any other trenches, the strata are labeled, as always, sequentially. However, the Stratum 2 in PF12 is different than Stratum 2 in PF10. It is the second stratum that we came upon, in this case, what Michael pointed out so clearly was unplowed Stratum 1. At one point, I had them take a 30 cm pass. Stratum 2 held no pottery inclusions, leading us to believe that perhaps while our soil was sterile of artifacts, it wasn't necessarily near bedrock. With only one day left in the season, we decided to start a sounding locus [1m x 1m] in the NW corner of the trench and dig it straight down to bedrock. 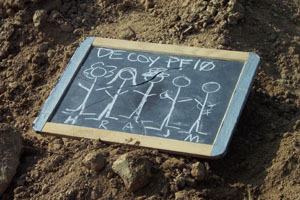 This way we would learn the stratigraphy of this area of the field. 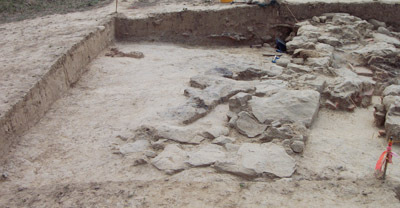 View of Trench PF 12 from the east at the end of the 2002 season. Stratum 2 was in essence a stratum never before seen in the FOD. In the structure currently being excavated, there was plow zone [Stratum 1], and Stratum 2 [occupied] and Stratum 3 [sterile]. Our strat 2 was new and it proved to be deep. 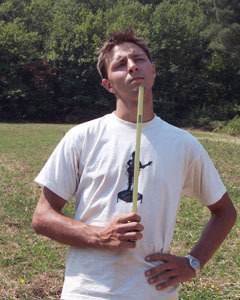 The entire locus was at approximately 1 meter in depth when the sounding locus was started. 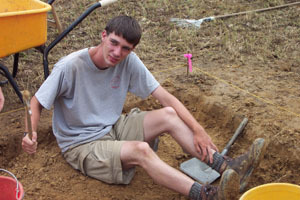 Andy and Michael had come upon large upcroppings of clay all along the eastern half of the trench. They painstakingly defined this clay as I started to dig to bedrock in our mini-locus. At 135cm, we found bedrock sheeting through the clay at the bottom of our locus. This proved to us that the FOD's bedrock undulates throughout the entire field and that perhaps there are other structures out there that are much lower in depth than we originally thought. The resistivity survey marks differences in sounding waves. Clay will be different than soil. Walls will be different than soil. However, they will both show up with the same lines on a survey. There is no way to tell if it is a wall or clay until you dig. PF12 found clay veins where we did not expect them, as well finding almost 100cm of Stratum 2. The transported crew of PF10, Michael Joyce, Andy Bozanic, Rebecca Cooper, and Hillery Pous proved to be wonderful sports at this experimental trench. Michael and Andy didn't even seem to mind working in the pit, especially if I told them when a wind was blowing so that they could stand up. I thank them for their spirit, in the Optimistic Trench. Katy's Pool. Photo by Joe Cosentino. Lifeguard: Andy Bozanic. Swimmers: Robert Belanger and Katy Blanchard. Michael Joyce, and Katy Blanchard. Photo by Joe Cosentino.